Travelling solo as a woman is not always easy. Safety issues aside, travelling alone means being constantly on your toes, aware of your surroundings and comfortable with the fact that if anything goes wrong, there’s only you to sort it out. It means meals for one with sympathetic glances from other diners, solo sunset moments surrounded by couples and nobody to offer tea and sympathy when the going gets a little tough. But if all that doesn’t put you off, then congratulations – because solo travel is an adventure like no other, a chance to experience destinations, meet people and create memories in an entirely different way to travelling with someone else. Travelling as a solo woman takes many forms, and there have never been more options to explore. If you’re looking for a week in the sun, possibly with a hint of romance thrown in, there are several tour operators that specialise in holidays for singles. These companies have reinvented the concept in recent years – gone are the days of bar crawls and enforced group jollity, instead you can simply opt in and out of excursions are you like, take advantage of the company of others when you feel the need and hang out on your own when you don’t. Activity breaks can be a great option for single travellers. Anything – from walking to wine tasting – can be done as part of a group trip, and there will often be other singles along as well as couples and friends. 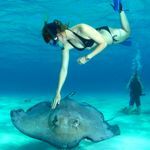 Many companies, understanding that these kinds of trips are popular with single travellers, don’t charge single room supplements and the experience of learning something with a group of others means that you may well make lasting friendships along the way. If you want to travel independently, the key is to combine a positive attitude with a healthy dose of common sense. Don’t imagine worst-case scenarios, but don’t be blithely optimistic either. 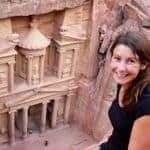 After years of travelling alone, everywhere from the Middle East to the USA, here are my six top tips. Look like you know where you’re going even if you don’t. Ensure you have a few all-important words in the relevant language: yes/no, thank-you, I don’t want, etc. If you can learn them as slang (‘cheers’ rather than ‘thank you’) so much the better. Most countries have expat populations, and you’re less likely to be hassled if you sound like you might live in the country rather than be visiting. Be realistic; mimsing around in tiny shorts and a vest top is going to attract more attention than linen trousers and a T-shirt. Blend in to your surroundings. If you’re in an Arabic country pay attention to the advice on what western travellers should wear – otherwise you are simply being disrespectful. A car is an absolute boon to the female solo traveller. It’s your freedom from gung-ho taxi drivers, buses where the person next to you “just wants to talk” and long, empty hours in coach stations. There is no greater barrier to hassle than walking the streets with a guide. Splash out on a city guide for an hour or two and it will enable to you adapt to the city, learn a little of the layout and gauge possible hassle levels for when you venture out alone. Being able to say no with charm is one of the most useful skills to learn and will come in handy everywhere from markets to bars, beaches and bus rides. Always add a smile and say thank you. Remember that what we perceive as ‘hassle’ may just be a normal way of communicating in the country you’re visiting. If something feels wrong or someone seems a bit shady, they probably are. If a situation feels even the slightest bit unsafe, remove yourself from it pronto. The other big question as a solo traveller is where to go? See my tips for the best destinations for solo female travel. And check out our tips on where to go on holiday after a break up. And don’t forget, you only have to travel solo for as long as you wish. Websites such as www.travbuddy.com and www.wandermates.com offer the chance to meet other solo travellers to share adventures, and the world of Skype and Facetime means it’s never been easier to share your memories with those back home. Be streetwise and sensible and you’ll have an adventure to always remember. Happy travels! * Save up to 40% on singles holidays. Enter your email address below and click "Subscribe" to receive my free deals newsletter. You can unsubscribe at any time. View the latest newsletter.